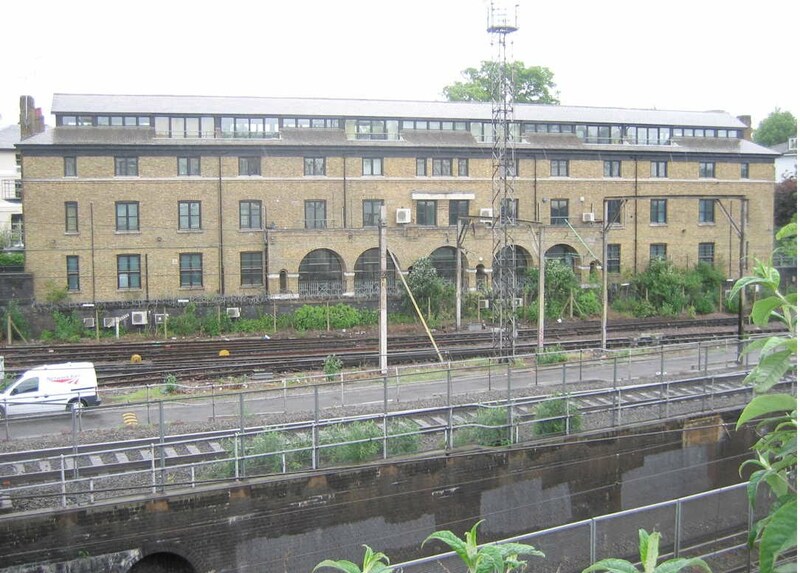 An important relic of the locomotive depot is the former enginemen’s hostel of 1928, originally Stephenson House but now called Iron Bridge House, located just off Bridge Approach and overlooking the line west of the Regent’s Park Road Bridge. It now serves as offices for media companies. The photograph also shows the elaborate system of burrowing junctions, created as a result of the need to separate different sorts of traffic. The new electric trains use two single track tube-type tunnels, which were added on the north side of the existing Primrose Hill Tunnels in 1917, from either the Euston line or the North London line without interfering with traffic on the main line. Chalk Farm has one of the most complex layouts on the system.